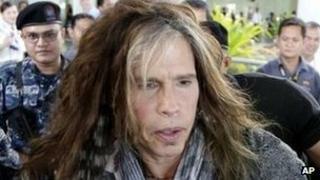 Aerosmith have cancelled a concert in Jakarta over safety concerns, a concert promoter has confirmed. The US band, who had been due to play in the Indonesian capital next weekend, issued a statement apologising to fans. "We... hope one day we can make it up to them," continued the statement posted on the Facebook page of concert promoter Ismaya Live. "They gave no specific reasons for the cancellation," said spokeswoman Sarah Deshita. "We are sad and disappointed." "We did all we could to ensure security was tight and even engaged the marines but it's not enough," she told news agency Agence France Presse. Ms Deshita said around 85% of the tickets for the concert had been sold. Security was tightened around the Burmese embassy and ambassador's house in Jakarta on Friday after two men suspected of plotting a bomb attack were arrested. Last year, Lady Gaga cancelled a concert in the Indonesian capital, citing security concerns following protests by religious groups. They had called upon the singer to tone down her performance but her management took the decision to pull the plug instead. Fellow pop star Rihanna twice pulled out of concerts in the city in 2008 and 2009. Singer Steven Tyler arrived in Manila on Sunday, where the band are due to play on Wednesday as part of their ongoing world tour.